Health Facility Planning Update February 2019. Inattentive programming of patient discharge – pretty much leads the way on this one and it is a Management issue and generally demonstrates a lack of control over clinicians who need to be held accountable for maintaining efficient and timely Discharge of patients from their Hospital ward. The management policy for Ambulance pick-up and delivery for a given Geographical Area needs to be developed so that Hospitals with 24-hour Medical cover can assist in the management of Emergency patients. These policies must share the load with respect the category of care determined by the Ambulance Service, so that not all patients will be delivered to the one Hospital. To obtain best effect with this model it will be ideal if Medical and Nursing staff are rotated between sites on a regular basis to ensure there are suitably trained and experienced staff available to deal with emergencies. Allied Health personnel – Physiotherapists, Occupational Therapists, Dietitian, Podiatrist, etc. Community Support Personnel – Psychologist, Social Workers, Mental Health Counsellors, Community Nurses, etc. Often these types of support can be provided using standard Examination/Treatment spaces or in standard Interview rooms, but occasionally can require more robust or purpose designed spaces to ensure staff safety. The discharge process will be greatly enhanced by the establishment of a Transit Lounge that is capable of accommodating patients from an inpatient ward who have been discharged by their Doctor. This area should be staffed 24 hours with a senior nurse in charge and it should always be fully occupied and should include a number of bed-bays and a mixture of reclining lounge chairs and stable, height adjustable armchairs where patients can wait for suitable transport to be arranged to take them to their residential accommodation. Emergency Departments should be able to quickly assess the patient to determine a diagnosis and should move the patient on to a location where further assessment can be carried out or treatment can commence. This may require reference to specialist input that may involve medical, surgical, psychological, psychiatric attendance or could require advanced Imaging or Pathology testing and could require the patient to be transferred to a short stay Emergency ward for extended tests to determine the diagnosis. This short stay arrangement could be a component of the ED or it could be located within a Medical (MAPU)or Surgical (SSU/HVSSS) ward so that appropriate staff can be available to oversee the beds until appropriate decisions can be made regarding the Care required. The Role of Health Facility Planners in Health Design Projects. (Complete article as submitted to ‘Hospital & Aged Care Magazine’ – reduced version published in December 2012/January 2013 edition – see ‘Publications’ page). In a recent presentation to the Healthcare Leader Development Association of Thailand (HealDAT) Garry presented to Thailand’s elite medical fraternity, the benefits of including a Health Facility Planner in their Hospital Design Teams. Some recent projects in Thailand have been designed by local Architects, working directly with Heads of Surgical Departments as the Design decision makers. The result is very high quality Architectural Hotel style public areas with limited thought given to Health Delivery Areas and Medical Logistics, resulting in a non-functional Hospital with excessive operating costs. The Health Facility Planner brings specialist expertise from experience gained over many Health Projects with varying budgets and differing objectives, and ensures the resultant Facility will demonstrate a best case balance of value for money, functionality and efficiency, with operating costs known and understood by the client and within a design created by the Architect. Often the issue is more about the importance of clearly defining boundaries for consultant roles within the Team appointed to plan complex facilities such as Hospitals and Aged Care Residential Facilities. 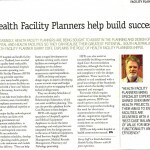 Garry Coff Consulting Services are proudly South Australian Health Facility Planners with 30 years experience in the industry, and we know that there are significant benefits when successful collaboration occurs with Architects, Health Facility Planners and Service Providers in the design of new and upgraded Health Facilities. the Health Facility Planner can take a Team Leader role and appoint sub-consultants to prepare the necessary reports or documentation, or conduct reviews as an individual. For major facility redevelopment projects the Health Facility Planner liaises with Health Service management and the Funding Authority and the local Department of Health to ensure needs are balanced with budget and required outcomes and will review population data with a Health Planner. The HFP will produce Schedules of Accommodation (SoA) and develop Master Planning Models that meet the predicted growth or change to a Facility Role Statement or Model of Service Delivery. This may take the form of a staged development of the Facility to make best use of the existing Assets and ensure the provision of facilities is managed to meet changing service delivery requirements and to minimize unnecessary capital expenditure. The Schedule of Accommodation (SoA) will be accompanied by a Relationships Concept Schematic that will indicate important ‘inter’ and ‘intra’ departmental relationships and critical service support links so that the Client organisation can visualize the workflow patterns implied by the planning. This will be a confirmation to User Groups and Hospital Executives that their needs are being considered and will provide a platform for the Cost Planner to form a budget for negotiation with the Funding Authority. A sub-set of specialists in the area of Hospital Logistics and Medical Appliance Specialists will participate in User discussions or will be contacted by the Health Facility Planner to ensure that the latest technology and work practices are integrated into the design process in the areas of Medical Equipment, Food Services, Supply, Waste Management, Medical Records Management, Pharmacy and Pathology processes. Governments and Private Hospital operator organisations are favouring the early appointment of Health Facility Planners to participate in Pre-design teams to assist in developing a more accurate scope and budget for projects prior to engaging the full technical design team. The HFP will prepare a base case, derived from clear knowledge and understanding of the Service Delivery processes and client objectives. Early analysis of building components across a site can open up options for long term Master Planning and can reveal unexpected opportunities when planning for redeveloping a Facility. Health Facility Planning Update June, 2018. Building a Team to assist you to develop a Successful Health Building Project. Project Manager – contracted to deliver a building that meets all the client/occupant needs, produced in accordance with applicable Authority Rules and Regulations, within an agreed budget and specified timeframe and for managing and recording the processes involved. Engineers working in the areas of: Structural and Civil, Electrical and Communications, Mechanical, Fire Safety, Hydraulics, Acoustics, Traffic and Parking, and Information Technology specialists. The Health Facility Planner role is directly linked to the Health Service management and service delivery strategy, largely determined by the Funding Authority and the local Department of Health. They work closely with Service Delivery Planners and Health Planners who produce analysis of the individual Facility catchment population and assist Governments to prepare Role & Function parameters for the Facility. The Health Facility Planner will review the population data with the Health Planner and will produce Accommodation Schedules and develop Master Planning Models that meet the predicted growth or change to a Facility Role Statement or Model of Service Delivery. This may take the form of a staged development of the Facility to make best use of the existing Assets and ensure the provision of facilities is managed to meet changing service delivery requirements and to minimize unnecessary capital expenditure. A similar team structure and design pathway is followed for the design of Aged Care Accommodation facilities although the focus is more attuned to the residents’ care, the preservation of dignity and privacy, and the design guidelines issued by the Commonwealth Department of Health& Aged Care. These need to be combined with a good knowledge of the Standards under which the Facility will need to be operated and managed. The assessment of Assets for suitability of use is another area that Health Facility Planners can assist Health Units to plan for replacement or upgrade of Facilities. A strategic analysis of building components across a site is an essential step in opening up options for long term Master Planning that can reveal unexpected changes of direction when developing a Facility. Negotiation of arrangements for certain work to be relocated to an alternative Hospital for the duration of the works. Architects and Designers have for a long time been singing the praises of such things as ‘Healing Courtyards’ and ‘Positive Energy’ spaces and at last documentation is becoming available following evidence based research studies in the USA that support the benefits of improving the built environment with this holistic approach. Studies conducted recently clearly show subsequent reductions in patient length of stay and improved rate of patient recovery, with consequent benefits to the patient’s family, visitors and the staff working in the area. Aged Care Accommodation within small, isolated rural communities. The development of Multi-Purpose Service Facilities (MPS) within small rural communities across Country Australia is having a major effect on the quality of life for aged residents. An initiative of the Commonwealth Government, this program was initially introduced and trialled within country South Australia and more recently has expanded into Queensland, Victoria and New South Wales with significant improvement to the peace of mind of all sectors of the community. resident comfort from being able to stay in their community – visits from friends and relatives on a frequent basis, including participation in community activities. Improved viability of small isolated Health Units. These factors combine to support rural Communities that have struggled to keep their towns alive. The knowledge that an Emergency support capacity is available within the Community provides peace of mind to local and visiting General Practice medical services knowing that they are supported and can respond with confidence in the event of accidents or work injury. Health Facility Planning Update March, 2012. Recent predictions indicate that potential for infrastructure improvements in the Health Sector look positive for the next 5 to 6 years with a steady increase in percentage spending on Hospital Upgrading and Replacement (Renewal) of major facilities from around 2% in 2012/13 then increasing 2 to 3% each year until 2017/18. Construction Forecasting Council (CFC) – Property Australia Magazine March 2012.